Did you realize that it is only a month until Valentine’s Day? I have hearts doodling themselves in my head already! As a way of saying “thank you” I’d like to offer a small doodle vase-quilt giveaway! I’m a beginner machine quilter. I have a brother. not a long arm. I have many quilts, wall quilts, etc.. that I’ve made through out the years.put them in a container to “need to be quilted”. I can’t afford for anyone else to quilt it so I need to know WHERE DO I START?? Do you have any simply design recommendations? Thanks so much!! What a beautiful addition to our table if we won one of your gorgeous doodle vase quilt. Thanks for the opportunity. You do such beautiful work Lori! Thank you for the opportunity to win one of your beautiful creations! I wonder if you might have any future suggestions for quilted pillow shams and/or throw pillows to dress up solid color (sage and navy) bedding? Your “doodles” are amazing! So many ideas! Being a machine quilter myself, I know these designs are quite close together and take time. Do you mostly work on small pieces? I’m always thinking how long it would take to do a certain design on a bed sized quilt. Maybe I would be more adventurous if I concentrated on smaller things. Simply gorgeous! I’d love to know more about how you choose your materials (thread, fabric, batting, needles). Also, I’d like to know more about mistakes in quilting you’ve learned from, I loved the post about your daughter saving a quilt from the trash and you getting a new look at it later. Oh, how cool is that! One of my goals this year is to learn FMQ. Thanks for the inspiration. Your quilting is just beautiful. I have also been thinking about Valentine’s Day. My oldest will be 25 that day. Of course I want a chance to win one of your beautiful projects! I love seeing your designs and how you break them down step by step———keep doodling with/for us. Well, that’s really, really pretty and how nice are you to have a give-away, thanks. It might be fun to see how you make these wonders. Maybe a picture of it set up on your machine. Is it a pretty big unit or does it look like a sewing machine? Suggestions? I have none. I enjoy being surprised by what you post and enjoy the variety. Question? Okay, do you do any sewing other than quilting? I do both quilts and garments but I don’t think there are a lot of garment makers out there any more. I love seeing all your pictures, especially the variety. I just found you via Pinterest. I’m now following via email. Great tutorial on the upward curl. I’m so glad you found The Inbox Jaunt. 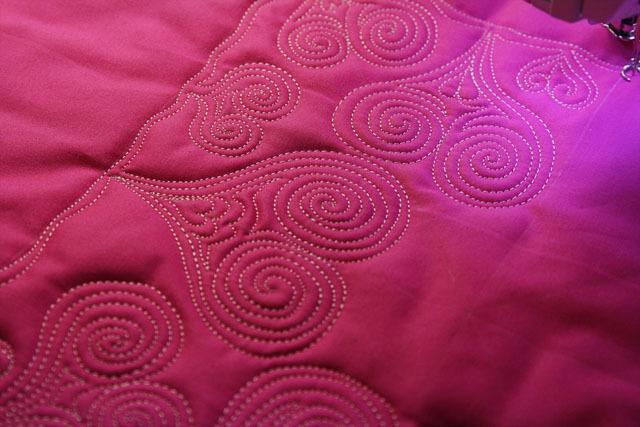 Lot’s of tutorials on FMQ–and more to come! Wow, you have some beautiful designs!! I’m hoping to branch out from just stippling, but I’m still quite scared of more intricate designs. Thanks for the giveaway! I’d love to win something like this! Beautiful! The quilting pattern reminds me of mola appliqué. This is so fun! Hey, have you quilted on satin? If so, do you do anything differently – needle, thread, whatever – or just work in your normal mode? Having only just discovered your blog, I’m afraid I have neither suggestions nor questions … I’ve subscribed and look forward to seeing more of the same from you. I’m so glad you’re here! Please chime in at any time with questions or suggestions–I would love to hear from you! How do you quilt so straight??? lol I think my hearts would have been wonky! Wonky is good! Embrace it–That’s the fun of doodle quilting. No straight lines, no perfection, but the overall effect works! 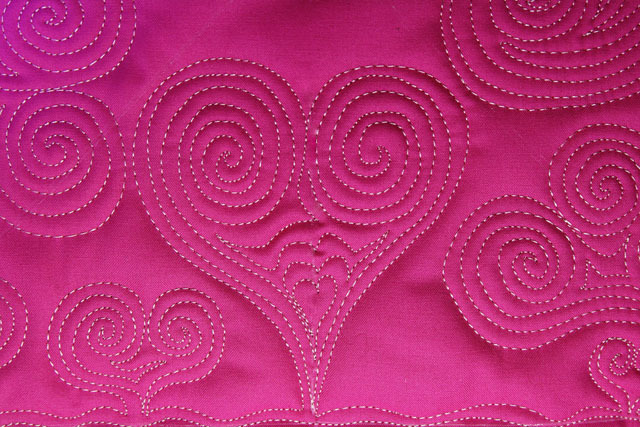 Hearts are my favorite thing to FMQ. Yours are so beautiful! 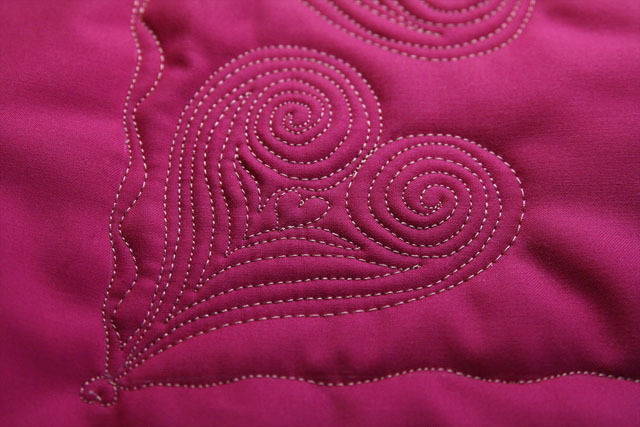 awesome – I love the quilt ideas but I also love your jaunt posts and photos! I love your blog!! How about some ideas for setting triangles for quilts set on point? I love feathers, but don’t want to bore my clients with the same feathers in every quilt. I am new to free motion quilting and am really struggling. Do you have any basic tips. I have have quilted for many years. I am just now interested in machine quilting. I look foward to your post because they inspire me to learn this new to me technique. Your quilts are beautiful. Hello, I absolutley LOVE quilts! Have since I was a kid. I only have one very tattered quilt passed down from my grandmother. I would love to learn how to make quilts myself, I suppose a sewing machine would be a great place to start. I have someone making a quilt for me, for my soon to be husband, but of course its very pricey. Speaking of valentines day, I am getting married on Valintines day, 2013! I happened upon your site because I was looking for ideas for a quilt to have made in rememberence of our very special day. I saw that you are giving away a very beautiful quilt and to be entered I had to leave a post. I hope I win, but regardless, it will be a real treat for whom ever wins it!